The Investment Banking team at LankaBangla Investments Limited has a unique combination of financial advisory, investing and operating experience across industries. Individually, some of them has established a successful track record at other leading organizations, prior to joining LankaBangla. Members of LankaBangla's Investment Banking team leverage each other’s' cross-product and cross-vertical capabilities to offer clients differentiated solutions. The team also spends significant time coaching the next generation of leaders, to ensure LankaBangla maintains depth of talent to support its growth initiatives. Mr. Saleh has been working for LBIL since 2012. He completed his MBA from North South University and BBA at IBA from Jahangirnagar University. He has been associated with some important projects of Investment Banking Services Department since his attachment. He has experience in Issue Arrangement, Subscription, Product Design, Compliance Maintenance and Business Development. He also has experience in Issue Management and Underwriting of Initial Public Offerings. Mr. Ehsanul is an investment professional with a history of working in the Investment, Private Equity & Venture Capital industry. He completed Bachelor of Business Administration (BBA) from University of Dhaka, majoring in Finance. He is also a CFA candidate and had passed CFA Level 1 in 2016. 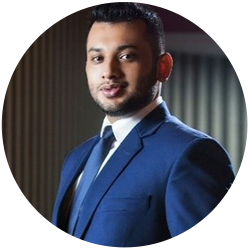 Ehsanul joined LankaBangla Investments in January 2018 from SEAF Ventures Management Ltd. – Bangladesh office of SEAF, where he was part of the Investment team. SEAF is a global private equity and venture capital firm having operations in more than 20 countries. Ehsanul is passionate about technology and loves to travel. Mr. Huda is with LBIL since December 2016. He has completed his BBA (Finance & Accounting and International Business) from North South University. Currently, he is engaged in activities regarding Mergers & Acquisitions, Corporate Advisory, and Issue Management and Arrangement services. Prior to joining LBIL he served as an Analyst in the Structured Finance Department of BRAC EPL Investments Limited. He is also pursuing the CFA program and passed Level I of the Program. Mohammed Refiyat Yaman joined the Investment Banking Services team in December, 2017. Prior to LankaBangla Investments, Mr. Yaman was with City Bank Capital Resources Limited in the Structured Finance Division where he worked on fund arrangement for large corporates through various debt and quasi-debt instruments namely Syndicated Loans, Commercial Papers, Bonds, and Preference Shares. In a short span of time, he has developed a strong network with most of the financial institutions and large corporates of Bangladesh. His core areas of strength include relationship management, research and analysis. Mr. Yaman graduated from North South University in 2016 with a double major in Finance and Marketing. He enjoys travelling and exploring new cultures and is a history enthusiast.